I understand the confusion. While the original 1913 Armory Show has huge significance for scholars of early-twentieth-century American art, for those with a more general interest in today’s art market the term “Armory Show” has a totally different meaning. Officially titled the International Exhibition of Modern Art, the 1913 show was nicknamed after its venue—the 69th Regiment Armory, located on Lexington Avenue between 25th and 26th Streets. A portion of the exhibition traveled to Chicago and Boston later in the year, and a 50th anniversary exhibition was mounted at the Munson-Williams Proctor Art Institute in Utica, New York, in 1963, but the Armory Show was a massive undertaking in an era before telephone, email, and air travel and was by no means an annual thing. 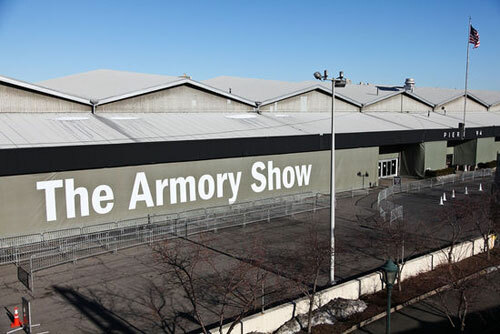 The exhibition that currently calls itself the Armory Show happens every March on the piers along the Hudson River in New York. It is by all accounts the largest art fair in the city—most of the world’s high profile modern and contemporary art galleries rent a booth, and the show attracts tens of thousands of visitors. The fair was founded in 1994 by a group of dealers and originally called the Gramercy Park Art Fair, after its initial location in the Gramercy Park Hotel. In 1999 the organizers relocated the fair temporarily to the 69th Regiment Armory on Lexington Avenue and renamed it the Armory Show, in homage to the 1913 exhibition. While its location at the Armory was only temporary, the current Armory Show was inspired by the idea of bringing new art from all over the globe together under one roof. In 2001 the organizers relocated once again—this time to the piers along the Hudson River, where the fair has been held annually since. The Armory Show at 100: Modern Art and Revolution is on view October 11, 2013 through February 23, 2013 at the New-York Historical Society.